Lucy is a free range rabbit, having the full run of the garden as her home. She doesn’t have a hutch; instead, she has dug a burrow under the garden shed. She’s safe here, well protected from the risk of passing cats or foxes. Rabbits are social creatures that have evolved to enjoy the company of others. In the past, it was common for single rabbits to be kept as pets: it’s now recognised that it’s far better for them to be kept in pairs or small groups. This allows them to express their natural social behaviours. In some countries (such as Switzerland), it’s illegal to keep creatures such as rabbits on their own: it’s seen as a type of cruelty. Lucy was originally one of two rabbits in the household, but when the other rabbit died, they decided not to get another. Lucy had began to get into fights with the other rabbit, and it seemed more peaceful just to have her on her own. It was around then that Betsy arrived, and it quickly became obvious that the rabbit and the dog were using each other to fulfil their social needs. Lucy was a mature two year old rabbit when Betsy turned up as a puppy. Lucy was bigger, stronger and more confident, and she soon laid down boundaries. The dog and the rabbit were to be friendly companions: there was to be no messing about, and Betsy was not to step out of line. Betsy grew up with the understanding that this was the way things were to be, and the two animals have since managed to co-exist peacefully. The two of them spend much of the day playing together, running up and down the garden, around trees and through the bushes. They chase each other, like children in a school playground. They even dig holes together, one pausing to gather breath while the other digs a bit more. And when they are tired out, they share a bite to eat, with Betsy gnawing one end of a carrot while Lucy nibbles the other end. There was never any obvious disagreement between the animals until last week. And when it happened, it was dramatic. Laura was inside having a cup of tea when she heard Betsy roaring and yelping as if she had been caught in a trap. She rushed out to find the two animals wrapped up together in a tussle. It was as if they were wrestling, and unbelievably. Lucy the rabbit had Betsy the terrier pinned to the ground. She was sitting on her head while Betsy was squealing for mercy. Laura had to pull them apart, and afterwards, both animals seemed to be in shock – they were shaking violently. Lucy didn’t seem to be any worse for wear: she hopped off into her burrow beneath the shed. Betsy was the one in trouble: she was quiet, and she refused to eat, so Laura brought her in to see me. The problem was obvious: she had a deep laceration on her tongue. Rabbits use their claws as weapons, and Lucy had obviously taken a swipe at Betsy’s face during the confrontation: she had managed to slice the surface of her tongue. The injury wasn’t bad enough to need to be stitched: soft food for a few days, and antibiotic cover to control infection were sufficient. Betsy soon made a full return to normal health. Betsy and Lucy have started playing with each other again, but understandably, Betsy is a little more cautious than she used to be. Rabbits may look like harmless bundles of fluff, but Betsy has learned that they need to be treated with respect. 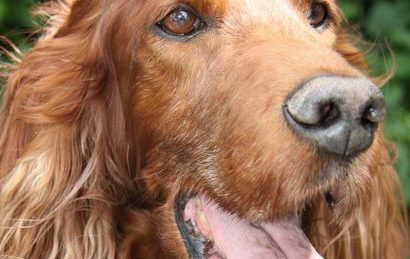 Or else…..
Digger, a 5 year old Irish Setter-Labrador cross bred rescue dog. 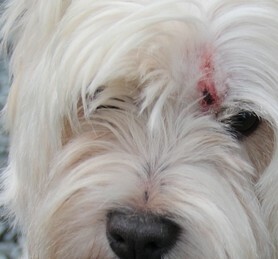 Hector, a 9 year old West Highland Terrier who was attacked by a dog. My dog often gets attacked/ attacks wild rabbits. They often leave my dog with swollen lips and few laps that calm down after a few days. My springer springs and stalks them, catches them and since the attacks crushes their bones to ensure they won’t attack again. My springer also moves boulders into their warrens to try to prevent them from coming out. She will drag the rabbit around the land especially the perimeters to try to deter them, but this only works for several weeks. 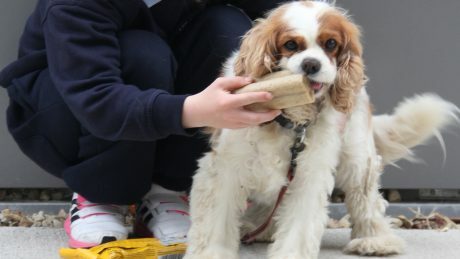 She is a very clever dog who is extremely determined and can open doors, drawers and windows. How do I stop her? It’s very difficult – dogs have such strong hunting instincts. The only way to stop her is to keep her confined.